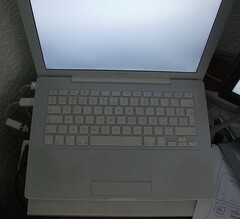 Back in the day I swapped the keys on my 12" powerbook keyboard around to read macgenius across the middle row. I unearthed the picture, and figured, why not do it to my apple aluminium keyboard? So I found a tutorial from some other guy that'd done it, and dug out my penknife. After that I decided to rearrange the macbook internal keyboard as well. First I googled around to make sure lifting the keys was the same as doing it on the external keyboard (which it appeared to be), then I went ahead and rearranged them as well. So whilst I was wondering what to do about it, my mother emailed me and suggested using ontherails instead of macgenius. So I did, and now the top row reads ontherails on the macbooks' internal keyboard. All pictures are licenced under Creative Commons Attribution 2.0 Generic licence and the above pictures, plus some in progress shots, are available in my Keyboard Modifications flickr set.